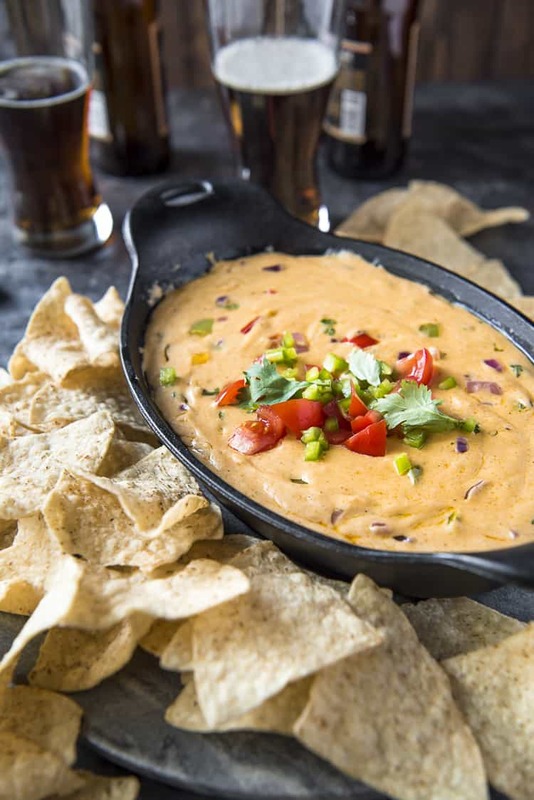 This Fajita Queso Dip is more than just an ordinary appetizer! Made with all-natural ingredients and stuffed with fajita-flavored goodness, this recipe will become your go-to party dip! So I hear there’s some sports ball game happening next weekend. It involves some animals and a guy named Tim…? Tom? JUST TAKE ME TO THE FAJITA QUESO DIP ALREADY! 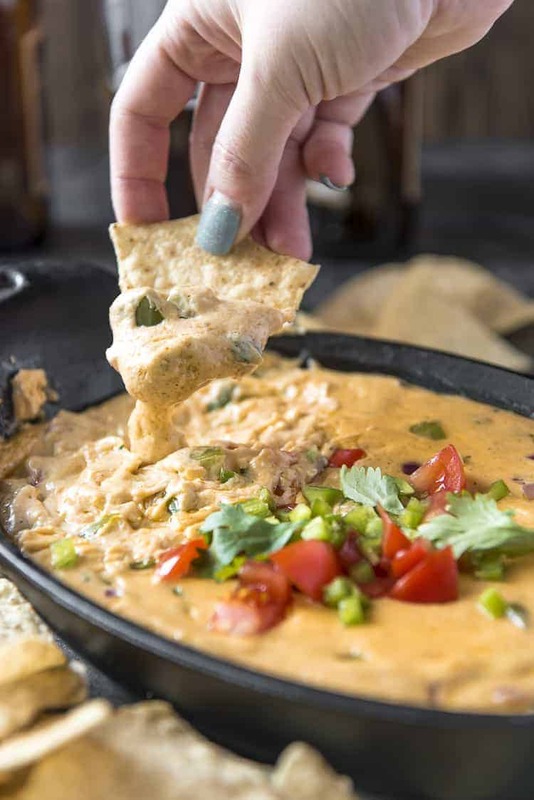 If you’d rather skip my (pretty darn helpful) tips and tricks, essential cooking info, and similar recipe ideas – and get straight to this deliciously easy queso dip recipe, just scroll right on down to the bottom of the page where you can find the printable recipe card! If there’s one thing I unconditionally love at any Mexican restaurant, it’s a bangin’ queso dip. Back in the day when I was a full time grocery employee, I’d sometimes eat a half a jar of salsa con queso on my lunch break. 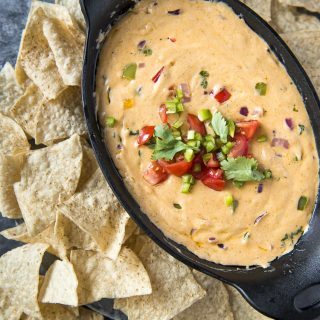 This Fajita Queso Dip is better than both of those! There’s no Velveeta in this dip, my friends, so if that’s what you came looking for – give this a shot before you move along! It’s completely vegetarian, full of diced peppers and onions, but you can add some meat if you’re really feeling the fajita vibes. 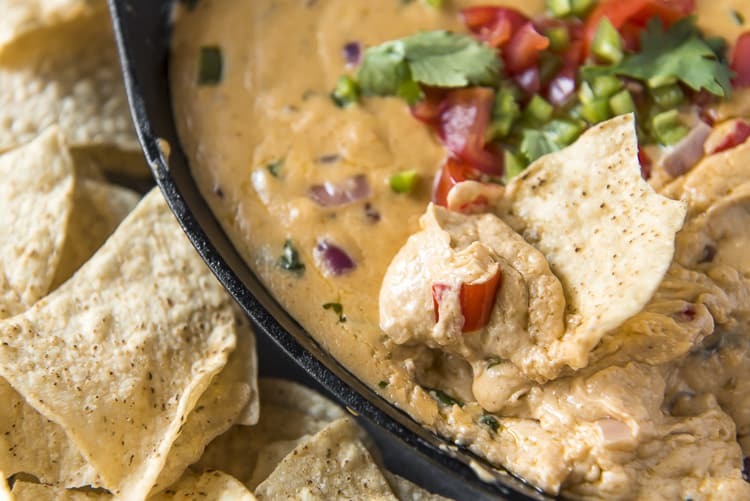 This Fajita Queso Dip is made with all-natural ingredients – there’s no processed cheese product in here! 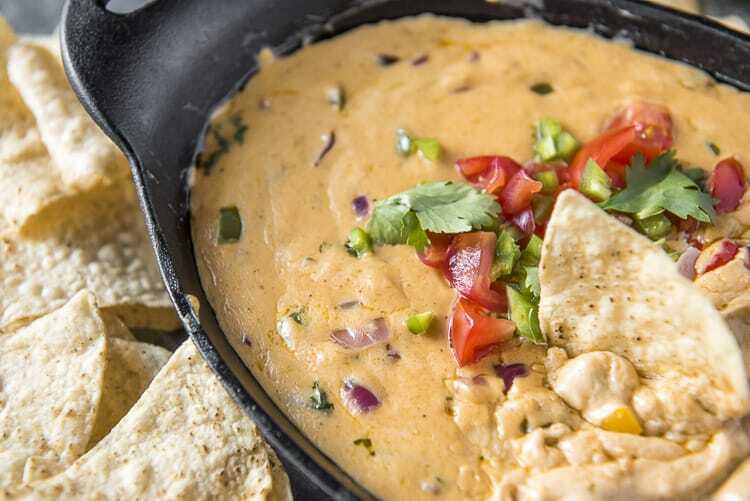 What Is The Best Cheese For Queso Dip? This recipe uses cream cheese and hand-shredded Colby Jack cheese for simplicity. Opt for hand-shredded off the block if you can. Bagged pre-shredded cheese is coated in cellulose, a preservative that prevents caking. It also prevents an even melt. A good blend of cheddar and Monterey Jack may also be used. For a white queso dip, cubed white American cheese is a common substitute. 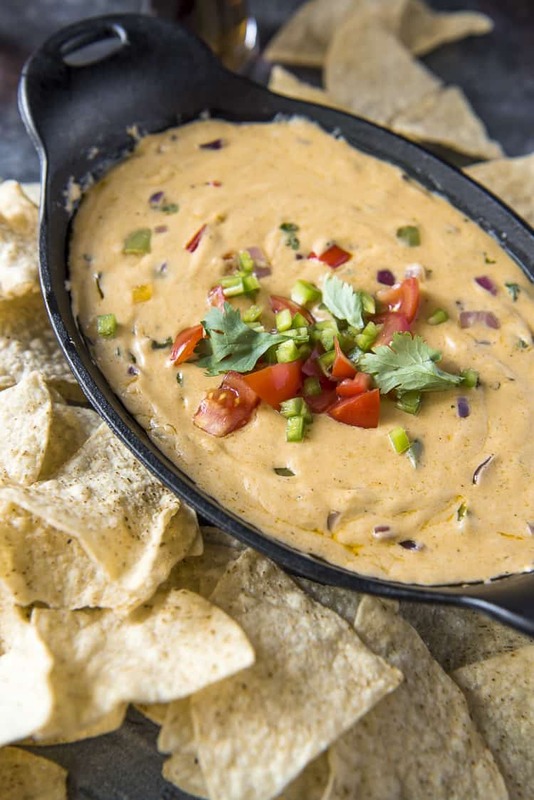 Tortilla chips are the BEST serving option with this queso dip! You can also serve this with a side of salsa for a bit of extra Mexican flavor. This queso dip is also delicious drizzled on tacos, burritos, and as a dip for quesadillas. , fathead “tortilla” chips, or lavash chips are delicious! It is! The amount of wheat flour used in the roux is negligible, but you can use almond flour in its place with no different flavor outcome. This recipe serves 12, and 1 serving contains about 3 grams of carbs. Substitute 1 teaspoon onion powder. First, melt butter in a cast iron skillet set over medium heat. Add chopped onion and bell pepper and cook 3-4 minutes until crisp-tender. Whisk in the fajita seasoning and flour for 1 minute until the veggies are coated. Next, add in the heavy cream slowly, whisking until it’s smooth, about 3-4 minutes. Reduce the heat to medium-low. Add cream cheese 1 cube at a time, stirring until it’s completely melted and combined. Then, stir in the Colby Jack cheese (shredded off the block!) a handful at a time, until the mixture is melted and well combined. Finally, stir in some fresh cilantro, if you’re using it. If you’d like the dip to be a bit thinner, add more cream until it reaches your desired consistency. Transfer the queso dip to a serving bowl and top it with diced tomato and jalapeno. Serve immediately. 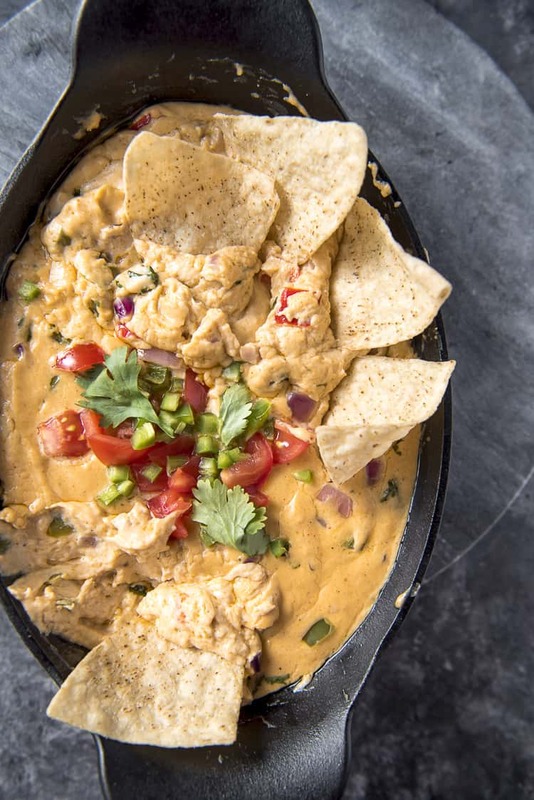 If you want to make this fajita queso dip more fajita-like by adding meat, please do! Before you follow this recipe, brown or sear your chopped/ground meat in the skillet. After the meat begins to brown, add the butter, onions, and peppers and follow the recipe as written. This way, the fat from the meat is incorporated into the bechamel (flour+cream+cheese sauce) smoothly, keeping the dip from breaking. Melt butter in a cast iron skillet set over medium. Add the chopped onion and pepper and cook 3-4 minutes until crisp-tender. Whisk in the fajita seasoning and flour for 1 minute. Add in the heavy cream slowly, whisking until smooth, 3-4 minutes. Reduce heat and add the cubed cream cheese, stirring until melted and combined. Stir in the shredded cheese a handful at a time, until the mixture is melted and well combined. Stir in cilantro. Add more milk if you prefer a thinner sauce. Transfer to a serving bowl and top with diced tomato and jalapeno. Serve immediately. 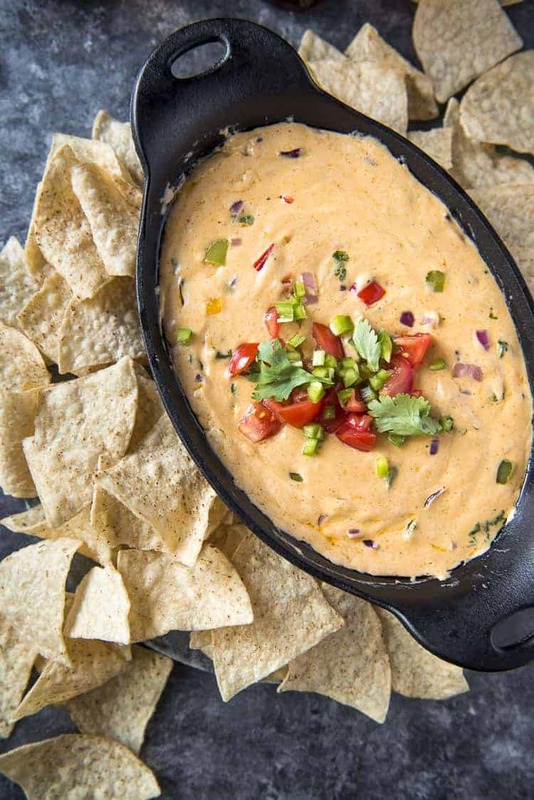 PIN THIS FAJITA QUESO DIP FOR LATER!